“I’m going hunting tomorrow morning,” I announced to the architect at a recent dinner party. “I didn’t know you rode,” he replied. I don’t. As a matter of fact, I don’t really hunt that often. I grew up hunting ducks and geese with my Grandfather who lived on the Eastern Shore of Maryland. But that was many seasons ago. This weekend, a very good friend of mine from college days called to ask if I’d like to go along. I downloaded my hunting permit, and equipped with a pair of Danner Duty Boots (a gift from my father-in-law), fleece lined Old Navy cargo pants, technical base layer, a balaclava, gloves and a wooly-pulley (father-in-law.) Al borrowed a shotgun for me since he couldn’t find any shells for my father-in-law’s 1938 L.C. Smith side-by-side. I was ready to go. I don’t have any camouflage clothing. But I do have one other serious piece of gear aside from the boots; that it happens to be something Queen Elizabeth II wears didn’t deter me in the least from zipping up the heavy brass zipper of my Barbour jacket and heading for a public swamp in Powhatan. We didn’t get anything that beautiful autumnal morning, but after struggling through the brush (“You went through that?” said Al looking at a dense thicket of brambles), my legs looked like I’d taken a round of birdshot. 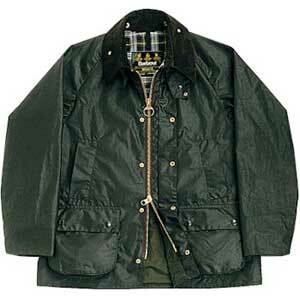 This entry was posted in Elegantology and tagged Barbour, clothing, elegantlogy, jackets, style. Bookmark the permalink. I’ve got a full-length one with all the odd-bits for buckling the flaps around your legs, and one of the quilted ones. Pretty mandatory for living on the coast of Wales… except for the hot pink and black flowered wellies, i fit right in! Ha! The wellies sound fun. Wonderful stuff the Barbour. Mine may be the only field-tested jacket in Richmond, VA. All the others I’ve seen are too clean. Sort of like owning a Range Rover that’s never been off-road, in my opinion. I figure that i did enough clomping across polo fields, standing track-side at jump races, up and down country lanes and through sea-side car boot sales, that mine was field-tested in my way. Sounds like it. Mine got doused with a little wet snow today. Mr. Blandings just – and I mean, just – walked through the door from hunting geese (with some success) in his Barbour jacket. Perfection. Pass along my congratulations. I just finished a gift of smoked goose by serving it with whole wheat tortillas, hoisin sauce, cucumber slices and a green onion. Delicious. And as close as I’ve gotten to a goose all season….